Dynasty's Red-Letter Encaustic Camel Hair Super Mop brushes are great for blending and smoothing out small areas. They're also ideal for applying powdered pigments — just dust them lightly over hot or tacky wax. 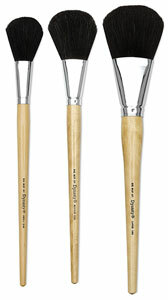 These brushes also work well with a variety of faux finishing techniques.